Read across america week starts soon with Dr. Seuss’s Birthday March 2. So I made a Cupcake Stand for Dr. Seuss Cupcakes shown here, while the cupcakes will be appearing over on It’s a Keeper. I grew up watching and reading all the Cat in The Hat Books and T.V. shows. I really like how they have incorporated how fun reading can be by implementing a week of reading in many schools. In my daughters school they definitely celebrate with crafts, food, and most of all reading. Each day students bring their books and towel and get to read outside. The students love to bring in their books and they read and swap them out to read different ones each day. This cupcake stand started as one that I bought at Jo-Anns and then I decorated it with the colors of Dr. Seuss. I got the stand with a 50% off coupon. Then I bought a few pieces of scrapbook paper that I thought would be fun. I made a templete from the circles and then cut out the paper and glued it on top of each circle. I think the whole project was less than $10.00, and I only need scissors and a hot glue gun. Then I put the circles together on the stand and glued on some red ribbon that I bought around the edges. It was super easy to do and can be customized in so many ways depending on your theme. I will be sharing these cupcakes shown here on It’s a Keepers website with the recipe and printables. Isn’t this Pennant so cute, I need it for my mantel, and also you can get the collection of Dr. Seuss Books below. 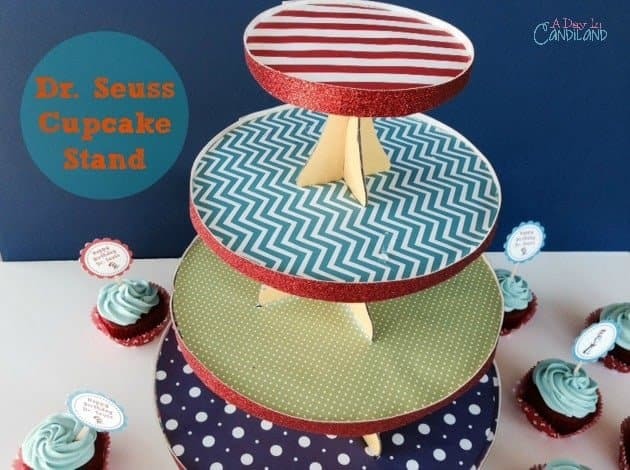 Here are a few other Dr. Seuss Posts, if you like this Cupcake Stand for Dr. Seuss Cupcakes, I am sure you will like these. Neat! That is how you make a custom up cake stand. I have always wondered 🙂 Thank-you for linking up to Bloggers Brags Pinterest Party. I have pinned this to our board! I love Dr. Seuss, just stocked up on some books that were on sale for his birthday. Great job and pretty cool. I never really thought about redecorating my existing cake stand. Thanks for the idea. Stopping by from Motivation Monday. Have a great week. Very cute ! I wish I would have thought to do this for my son’s Disneyland themed party last year! Thanks for sharing at Merry Monday! 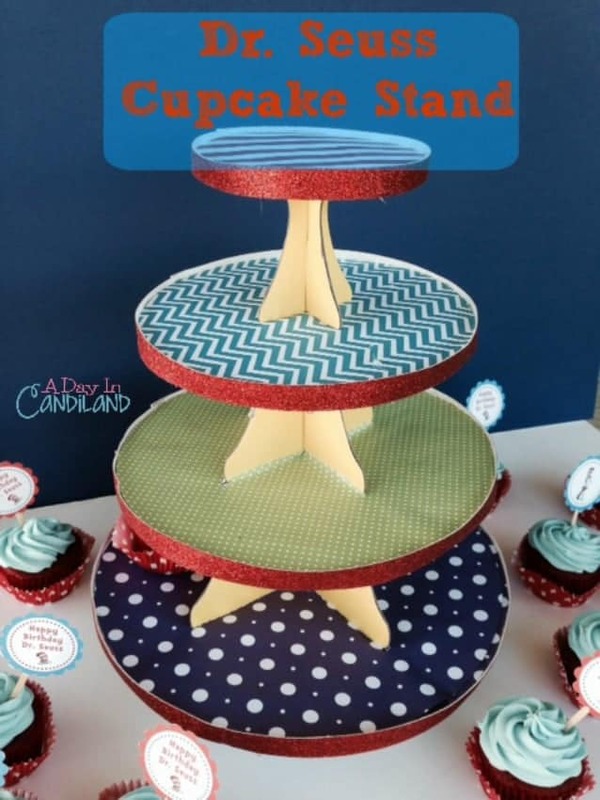 Super cute and fun cake stands. 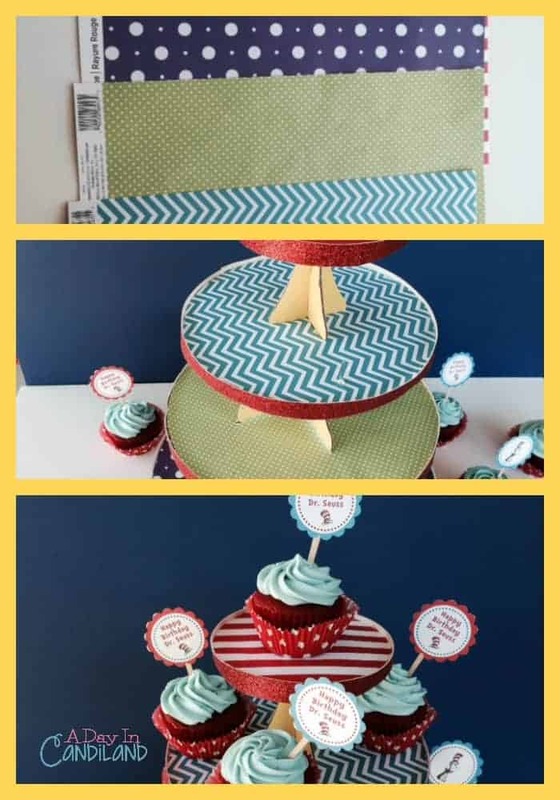 Perfect for any occasion, not just Dr. Seuss’ birthday! Visiting from Weekend Retreat party.